The Stables01263 715779work01603 870304fax Self-cateringThe Stables, a spacious property on one level, is situated in Quidenham in South Norfolk. It is an ideal location from which to enjoy a day at the motor races at Snettisham or to travel by train to Cambridge or the cathedral city of Norwich from the station which is a few miles away. Front view of property, with gravel drive. The Stables offers weekly bookings starting on Friday. 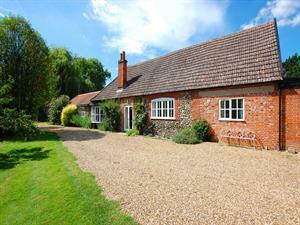 The Stables, a spacious property on one level, is situated in Quidenham in South Norfolk. It is an ideal location from which to enjoy a day at the motor races at Snettisham or to travel by train to Cambridge or the cathedral city of Norwich from the station which is a few miles away.